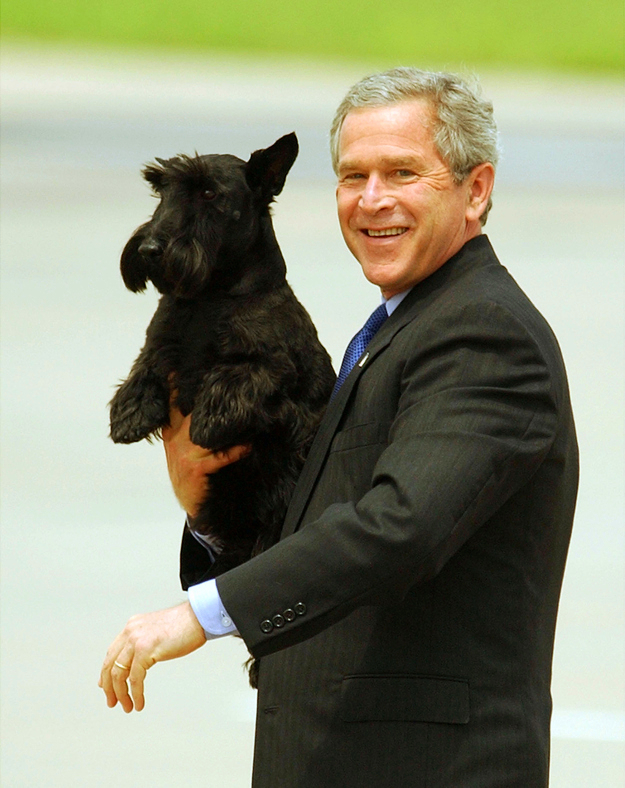 THE SCOTTISH TERRIER IS A PRESIDENTIAL DOG! The Scottish Terrier, also known simple as a “Scottie”, are fabulous dogs to be around. American president, George W. Bush owned one of these dogs! The Scottish Terrier is a small terrier and is highly adaptable to many types of home environments. They are typical terriers that will not back down from a challenge. The Scottish Terrier also can be very stubborn at times and usually prefer one person in the household over the other. They are dedicated, clean, small dogs. The breed needs to be brushed or combed out on a regular basis. Like the Miniature Schnauzer, the beard needs special attention because of the accumulation of food and saliva that causes the hairs of the beard to stick together. This leads to matting. The muzzle may also take on a rust colored appearance due to the presence of proteins in the saliva. Because of their stubborn nature, this breed is not the easiest dog to train. They have a mind of their own but they are lovable dogs! The Scottish Terrier is a healthy dog except for one neurological condition called the Scottie Cramp. It is a neurological condition dealing with serotonin breakdown leading to excessive flexion and extension of the hind limb musculature. Most episodes start when the dog gets excited but subside in about 10 minutes. The condition worsens as the dog ages. Treatment is medical or via acupuncture. It is a congenital condition; one that the dog is born with. Any Scottish Terrier exhibiting signs of the disease should not be bred! For those people who want a clean, small dog with an independent twist to it, you can not go wrong with the Scottish Terrier! Bravo! Learn more about the Scottish Terrier at Animal Planet’s® Dog Breed Selector.